Political observers will remember the 2003 California gubernatorial recall election, where 135 candidates ran in the election to replace Governor Davis. Rod Kiewiet and I wrote about how this complex election produced difficult decision problems for voters, and in a different paper (with Goodrich, Kiewiet, Hall and Sled) I also wrote about how the complexity of the recall election posed administrative problems for election officials. The upcoming June primary in California is shaping up as one where again we have a complicated race, though this time it is for the U.S. Senate. In the primary for the U.S. Senate there are 34 candidates competing to win the primary, and to move on to the general election in November. There have been a few preliminary reports in the media about how the crowded ballot might be problematic for voters when they try to find their candidates in the primary election. So I took a look at the sample Democratic ballot for Los Angeles County, which is reproduced below. 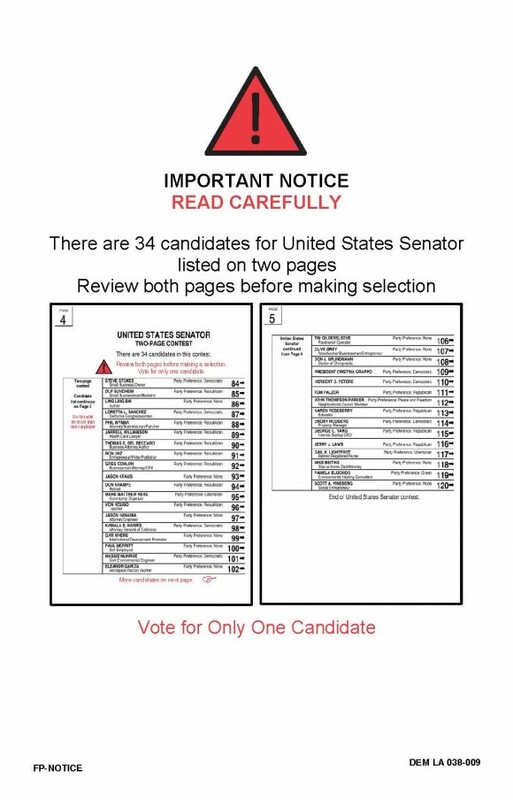 The first page is designed to tell voters that the ballot for the U.S. Senate will have two pages, and it reproduces each page. 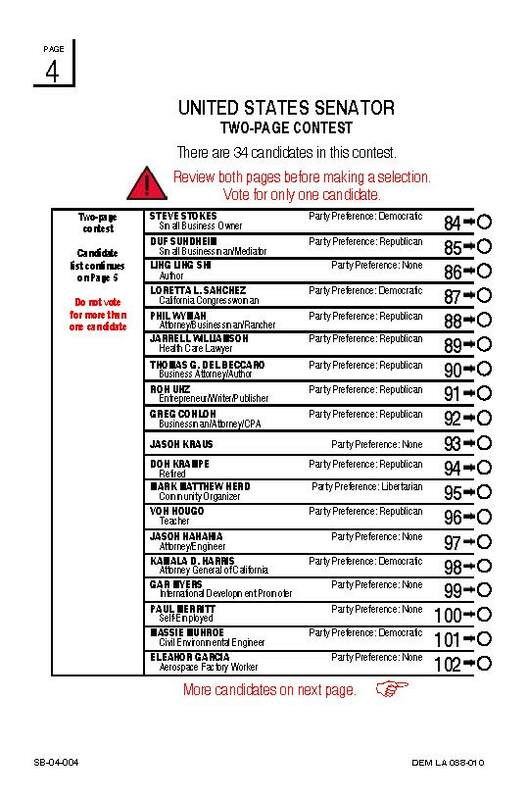 The next two pages show what the ballot will look like in L.A. County; in this example, there are 19 candidates listed on the first page, and 15 candidates listed on the second page. 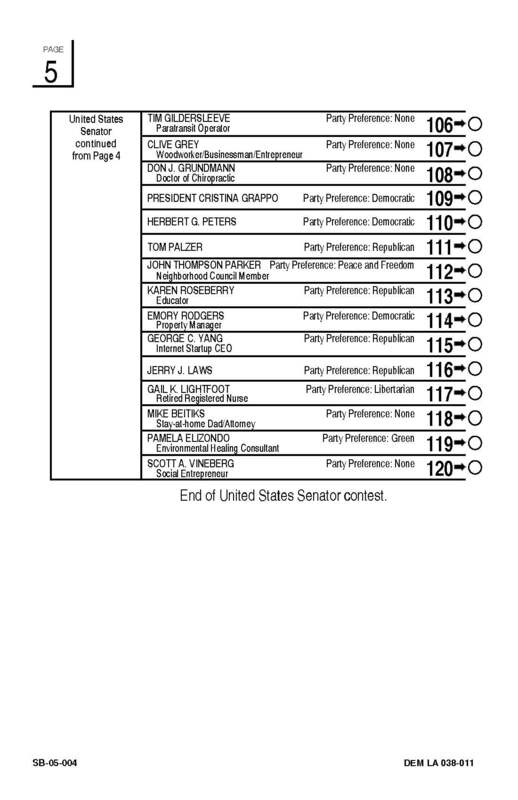 The way this ballot is laid out, voters would need to look for their candidate on the first page, and then if they don’t find their candidate listed there, flip to the second page to find their preferred candidate. This is just an example from L.A. County, which uses a unique voting system (“InkaVote”). While the sample ballot provides ample warnings to voters to only vote for one candidate, and to check both pages for their candidate of choice, there’s a good chance that we’ll see voters make mistakes. In particular, we may see a increased risk of overvotes for the U.S. Senate race, as some voters may not understand that they are only supposed to vote for one candidate (or not see the warnings) and instead may believe they are supposed to make a mark for a candidate on each page. We may also see voters get confused and just skip this race, which might result in an increased rate of undervoting in this election. As other counties are using different ballot designs and layouts for this race, this is just an example of what might happen in L.A. County. Given the complexity of this ballot and election, there’s a good chance that we might see increased rates of both undervoting and overvoting across the state this June, though the exact causes for that will depend on the specifics of ballot design and layout in each county. Whether these designs and layouts lead to systematic voter errors of the sort seen in 2000 is not clear at this point, as I’ve not had a chance yet to look at sample ballots from many of the larger counties in the state. However, we do know from research published about the infamous “butterfly ballot” used in Palm Beach County in the 2000 presidential election, even a relatively small number of voter mistakes can be influential in a close election (see the paper by Wand et al. on the butterfly ballot). If the U.S. Senate primary is close in June, we could see some scrutiny of ballot design and layout, and whether problems with design and layout may have led to voter error. This entry was posted in 2016 Election, election administration, Voting technology on May 10, 2016 by Michael Alvarez. Last week President Obama visited the South By Southwest event, and he got engaged in a pretty wide-ranging discussion about a lot of ways in which the federal government could do a better job using technology to engage citizens in government. You can watch the video, or read the transcript. THE PRESIDENT: Exactly. I’ve give you a second example, and that is the issue of voting — I mentioned this earlier. We’re the only advanced democracy in the world that makes it harder for people to vote. (Laughter.) No, I hear laughing, but it’s sad. We take enormous pride in the fact that we are the world’s oldest continuous democracy, and yet we systematically put up barriers and make it as hard as possible for our citizens to vote. And it is much easier to order pizza or a trip than it is for you to exercise the single most important task in a democracy, and that is for you to select who is going to represent you in government. THE PRESIDENT: There is a reason I’m bringing this up. (Laughter.) But it’s not just Texas. And so one of the things that we’re doing is engaging folks who are already doing interesting work in the online space, how can we create safe, secure, smart systems for people to be able to vote much easier online, and what are the technologies to help people get aware of what they’re voting about, who they’re voting for — that’s, again, an issue where you don’t want the federal government engineering all that. But what we can do is to have the incredible talent that’s represented in this auditorium really spend time thinking about that and getting to work on it. This sounds interesting — it’s an excellent idea for the federal government to launch an initiative like this; a large-scale research effort to study “safe, secure, smart” systems for the administration of elections. I look forward to hearing more about this as the election season progresses, and I hope that the President makes good on his promise to “engage folks who are already doing interesting work” in this area. So as way of a shout-out to the President, the team at the Caltech/MIT Voting Technology Project has been working on these issues since 2000, and we are ready to do more! This entry was posted in election administration, Uncategorized, Voting technology on March 14, 2016 by Michael Alvarez. This just brought back memories of elections past, of paper ballots being counted by hand, and elections being conducted without strong post-election audit procedures. Regardless of whether the election is for the president of the United States, or for a student trustee to a local board, having strong administrative procedures can help insure that when elections are close and the results are disputed, there aren’t questions about the integrity of the election. This entry was posted in Post-election audits, Voting technology on March 10, 2016 by Michael Alvarez. The Presidential Commission on Election Administration’s report is getting a lot of attention and praise following its release on Wednesday. One aspect of the report I want to highlight is the degree to which the Commission aimed to ground their findings in the best available research, academic and otherwise. It renews my faith that it may be possible to build a field of election administration that is more technocratic than it currently is. The report’s appendix, available through the supportthevoter.gov web site, is a valuable resource on the available research about each aspect of the commission’s charge. Much of this research effort was assisted by the Democracy Fund, though of course, the research is all the work and opinions of the authors. Speaking personally, I greatly appreciate the support and encouragement of the Fund through these past few months. This entry was posted in early voting, EAVS, election administration, election reform, electronic pollbooks, Presidential Commission on Election Administration, residual vote analysis, Uncategorized, voter registration, voting system vendors, Voting technology on January 24, 2014 by cstewart. I just spent my morning out in Gaithersburg on the NIST campus, listening to the meeting of the EAC’s Technical Guidelines Development Committee (TGDC). The day has just ended. However, tomorrow will be a full agenda, too. You can listen in by going to the following link: http://www.nist.gov/itl/vote/. Tomorrow’s agenda will focus on UOCAVA-related issues. Check it out. As I was watching today, I reflected on proposals to abolish the EAC, and just to let NIST deal with standards. As I watch the interaction between the EAC staff and commissioner Davidson, TGDC members, and NIST staff, it’s clear that each provides a set of distinct perspectives and, some would say, checks and balances. In particular, the EAC provides a distinctly public perspective on the proceedings, which would be difficult to replace if it weren’t responsible for the proceedings. This entry was posted in Voting technology on July 26, 2011 by cstewart. During my lunch talk at the Technology, Diversity, and Democracy conference Mike has previously reported on, I used the case of Palm Beach County, Florida to discuss how metrics to gauge the quality of the voting process sometimes are right under our noses, and under-utilized. Here is a little more detail about PB County (and all of Florida), along with a comparison with LA County (and all of California). The accompanying graph shows the residual vote rate for Palm Beach County, Florida, from 1992 to 2008. (As far as I can tell, Florida did not gather separate turnout statistics prior to the 1992 presidential election, so we can’t calculate the residual vote rate earlier than 1992.) For the purpose of comparison, I also show the rate for the whole state (excluding PB County) and the nation. The PB County residual vote rate surged in 1996 (perhaps an early sign of maintenance issues with the punch card devices?) and again in 2000. By comparison, the residual vote rate for all of Florida, while a bit above the national average, was basically flat. After 2000, Florida not only quickly abandoned the antiquated systems they were using, but they also instituted a reporting system that tracks explicitly the residual vote rate for the top-of-the-ticket races every two years. Here, for instance, is the 2008 analysis of over- and under-votes. The results of these changes are evident after 2000. In PB County, the residual vote rate dropped from 6.4% in 2000 to 0.5% in 2004. In the rest of the state, the rate dropped from 2.6% to 0.4%. These numbers moved up a bit in 2008, but it’s clear that PB County, and the state as a whole, has entered a new regime in striving to make every vote count. Now look at a similar graph for LA County, along with the rest of California. California’s residual vote rate has been trending downward since 1992, dipping down below the nationwide average before 2000. But as the rest of the nation has aggressively tried to reduce residual vote rates, the rest of the nation has now caught up with California. LA County, which started off significantly higher than the rest of the state — with a notable spike in 1996 — has seen its residual vote rate drop faster than the state as a whole, so that it is now fairly close to the statewide and nationwide averages. Note, by the way, that there is no dramatic shift in the residual vote rate — absolutely or compared with the state as a whole — with the introduction of the Inkavote system in 2004. The downward trend just continues. The differences between California and Florida, and between Los Angeles and Palm Beach counties, are significant, when we think about how elections are run in both states. However, there are many similarities. Both are large states that rely on fairly large counties to conduct elections. Leaving aside LA County, the average California county had a turnout of 179,000 voters in 2008, compared to an average of 126,000 in Florida counties. County election directors in both states are on the whole highly professional, even though they are chosen in different manners. Aside from the fact that California ballots are much longer than Florida ballots, one major difference is that Florida has institutionalized an effort to minimize “lost votes,” whereas California has not. In 2008, the residual vote rate for Florida was 0.7%, compared to 1.3% in California. If California could reduce that rate to Florida’s, over 82,000 additional votes would be recovered among Golden State residents in presidential years. The number for LA County alone is over 20,000. This entry was posted in residual vote analysis, Voting technology on September 18, 2009 by cstewart. Not exactly a blog, but the EAC has gotten a lot better about using technology to make their hearings and meetings public. I went to their website today and found this set of notes from Commissioner Donetta Davidson and Matt Weil on early voting in Florida. For those who don’t know already, the big innovation in Florida this year is the requirement that ballots be printed on demand. Conny McCormack was down there as well, and I’ll see if Conny wants to put up a guest posting on the blog. This entry was posted in early voting, Voting technology on August 22, 2008 by gronke. 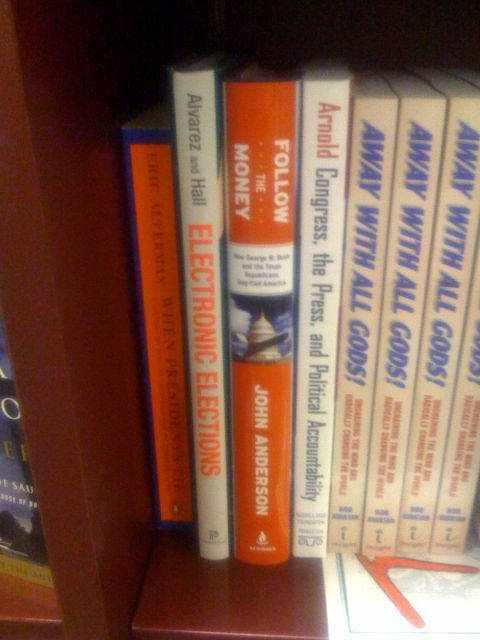 It’s always nice to see your book on the shelf in a bookstore – this time our local independent bookstore, Vromans. This entry was posted in Uncategorized, Voting technology on August 2, 2008 by Michael Alvarez.